It's a feast for the science-curious senses: in June, two cohorts of two dozen middle-school girls came together for the free, STEM-focused, four-day-long Physics Wonder Girls Camp sessions organized by Dr. Roberto Ramos, associate professor of physics at the University of the Sciences in Philadelphia. The girls studied the properties of light, built telescopes, designed and engineered submersible robots, and learned about scientific professions directly from the experts: nanoscientist and Chair of Bryn Mawr College's Physics Department Dr. Xuemei Cheng; INTEL software engineer Dr. Marisa Bauza-Roman; and several female food scientists from Puratos, a global company working with bakers and chocolatiers to assess the best ways to improve their products, all came and talked about their professions, answering questions and interacting with the campers. Plus, they got to be on TV! The camp was initially inspired by Dr. Ramos' daughter Kristiana who expressed interest in the sciences early on. 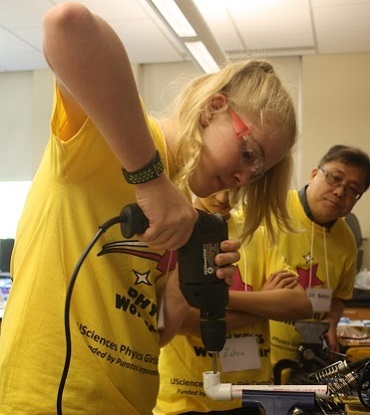 Now in its sixth year, Physics Wonder Girls Camp was partly supported this summer with an SPIE Education Outreach Grant in the amount of $4,300. "The SPIE grant enabled the Physics Wonder Girls Program to incorporate hands-on optics and photonics experiments into the camp,” says Dr. Ramos, who also made use of the educational resources available on SPIE's website. 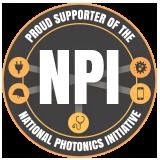 "This immersive experience with optics phenomena enabled the middle-school girls and a crew of five of our physics majors to appreciate the properties of light – reflection, refraction, diffraction, and interference – and to consider careers related to optics. Many of the campers and crew might have been introduced to optical phenomena, but to actually experience them in ways that emphasized real-world applications was transformative. Our physics majors, for instance, had the opportunity to train on optics experiments that they never had done before; the experience opened their eyes to new vistas and possibilities for their future." A program that's popular not just with the students but also with their parents, Physics Wonder Girls Camp evokes excitement, determination, and motivation in equal measure. Participation in the camp is by application and the selection process ensures that the students come from diverse backgrounds and environments, offering girls who may not otherwise have such an opportunity, a life-changing experience. The response, says Dr. Ramos, has been inspiring. "I really appreciate [Dr. Ramos and his team] taking the time to work with us and encourage girls to become scientists," eighth-grader Sophie Tomov shared in her feedback; or, as seventh-grader Jennia Zhang put it: "It took four days for all of you to make a difference in my life." For Karla Miletic, a physics major set to graduate in 2020, the experience was eye-opening: "I realized that explaining and adapting science to these highly interested but young girls requires a deeper understanding of the given physical concepts than one might assume. I found that it tested my understanding and challenged me in different ways as opposed to old-fashioned course-work and examinations. This experience was, therefore, utterly useful since I am considering a career as a college professor." 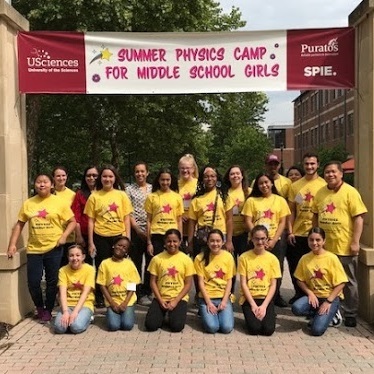 Some parents have told Dr. Ramos that even if the camp wasn’t free, they would have paid to ensure this particular experience for their daughters; some noted that the Physics Wonder Girls Camp has profoundly changed their own perspective of a science career for their daughters. As Dr. Ramos points out, there are many optics experiments that can truly ignite interest among K-12 and college students and that can help realize potential careers related to optics. He and his team have created a program that’s doing just that; creating one that’s proved transformative for their parents’ vision is just the icing on the cake.